When comparing the revenues of the largest retail chains in Asia, the comparison is being drawn between the biggest retail chains in the likes of China, Hong Kong, Japan, Russia, Taiwan, Thailand and Turkey. Even though these Asian countries have some of the largest consumer populations in the world, the retail chains in these countries are not at the top of the World's Largest Retail Companies list compiled and published each year by Deloitte Touche Tohmatsu. There are two primary reasons for Asia’s lack of dominance in global retailing. 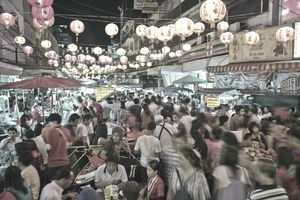 First, even though Asian countries contain the most people, those people are not the biggest consumers. The reason they are not the biggest consumers is that they do not possess the greatest individual wealth. This might seem contradictory to the fact that Asian countries have been targeted in recent years by some of the largest luxury retail brands. But in countries like China, Japan and Russia, there is an extremely wealthy upper class, and an extremely impoverished lower class, and not much middle class in between. Having said that, the emerging middle class in Asian countries is growing at an accelerated rate, so not only will that create a shift in Asian retailing in general, it will create a different platform from which the largest Asian retail chains can expand both domestically and globally. The second reason why Asian retail companies are not dominating the global retail landscape is that much of the continent's consumption is local and decentralized. Unlike the retail landscape in the U.S., there aren’t massive national retail chains and retail franchises that are duplicated in every city and town. The cookie cutter chain store void that exists in Asia is not coming so much from Asian based retailers as much as it is starting to be created by the largest U.S. retail chains and European based retailers. Again, this is particularly true in the luxury retailing sector where Coach, Michael Kors and Tiffany from the U.S., and Gucci, Armani, and Louis Vuitton from Europe have established a significant retail presence in high-priced Asian shopping districts. Of course, the 7-11 convenience store chain is the most ubiquitous Asian based retailer in the U.S. In recent years Japan's UNIQLO fashion retail stores have been expanding in major U.S. cities. But for the most part, Asian retailing is found in the car dealerships of auto brands like Nissan, Honda, Hyundai and Toyota. Each year a “Global Powers of Retailing” report is compiled by Deloitte Touche Tohmatsu, ranking retailers from all over the world according to total revenue. In 2018, the annual list was released, ranking 250 retailers from various countries. What follows is the largest retail companies with headquarters in Asia, such as China, Hong Kong and Japan. Even though Russia and Turkey are both European and Asian countries, they are included on this Asian list. This 2018 Global Powers of Retailing list reflects the revenue that was generated in 2017. This list is archived for historical global retailing and research purposes. China: JD.com, Inc, No. 28 global retail ranking; Non-Store. Hong Kong SAR: A.S. Watson Group, No. 51 global retail ranking; Drug Store/Pharmacy. Japan: Fast Retailing Co., Ltd., No. 58 global retail ranking; Apparel/Footwear Specialty. Russia: X5 Retail Group N.V, No. 62 global retail ranking; Discount Store. Taiwan: President Chain Store Corp., No. 154 global retail ranking; Convenience/Forecourt Store. Thailand: CP ALL Plc., No. 75 global retail ranking; Convenience/Forecourt Store. Turkey: BİM Birleşik Mağazalar A.Ş., No. 149 global retail ranking; Discount Store.